For the first time in Australia’s international sporting history, an Indigenous artist has been commissioned to design the Commonwealth Games’ medals. 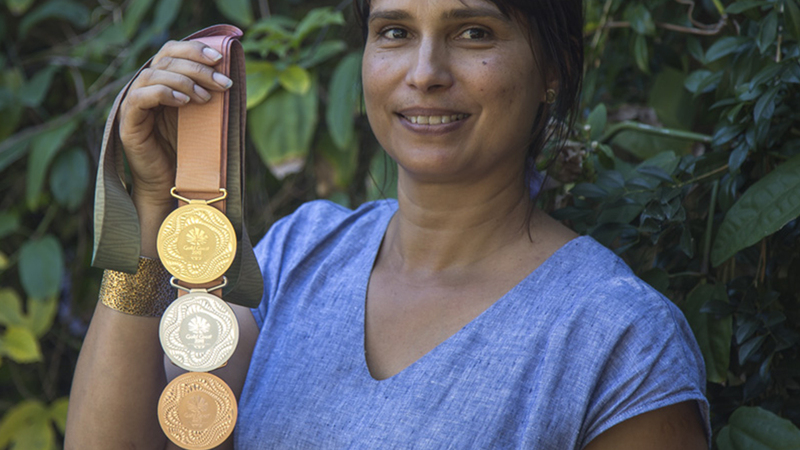 Delvene Cockatoo-Collins, a local Nunukul, Ngugi, and Goenpul woman of Quandamooka Country, is responsible for the artwork featured on the GC2018 medals. The medals and ribbons featuring her artwork were revealed in November last year and Ms Cockatoo-Collins said being chosen to design the medals was a career highlight for her and her family. “I am very excited and honoured to have been asked to design the prizewinners’ medals for the Gold Coast 2018 Commonwealth Games,” she said. Raised in south-east Queensland’s Moreton Bay area, and living and working in Minjerribah, on North Stradbroke Island, Ms Cockatoo-Collins is influenced by the beauty of Queensland’s coastline. Her art style takes inspiration from Indigenous dot-paintings, an approach that enables her to continue telling the stories and traditions passed down through her family. “The story of the soft sand lines on the medals and the woven strand of the freshwater reed, depicted in the ribbon, holds great meaning for me and I’m honoured to have shared these stories with the athletes,” she said. The ribbon pattern on the medals is based on a local freshwater reed (Yungair) that grows along the south-east Queensland coast. Traditionally, three pieces of reed are woven together to make baskets for carrying babies and food. This method of weaving is passed down through Indigenous families. Ms Cockatoo-Collins learned from her mother, who learned it from an Aunty. Previous Commonwealth Games medals have never before featured an Indigenous Australian artist, making Ms Cockatoo-Collins’ design a first. The last Commonwealth Games in Australia were held in Melbourne in 2006 and the medals featured the Commonwealth Games Federation logo. Australia also hosted the Perth Games in 1962, and in Brisbane in 1982, and the CGF logo also appeared on these medals. In stark contrast to previous years, Ms Cockatoo-Collins’ design is distinctly Australian, and deeply personal to her, as she used her special connection with the coast, a place where people come together, to inspire her work. These medals have been well-received by Australian athletes, according to Ms Cockatoo-Collins, who has loved the reactions to her artwork. “Hearing the responses and seeing the reactions of the athletes when viewing the medals, has been an absolute joy, and reaffirms the integrity and spirit in the design I intended,” she said.